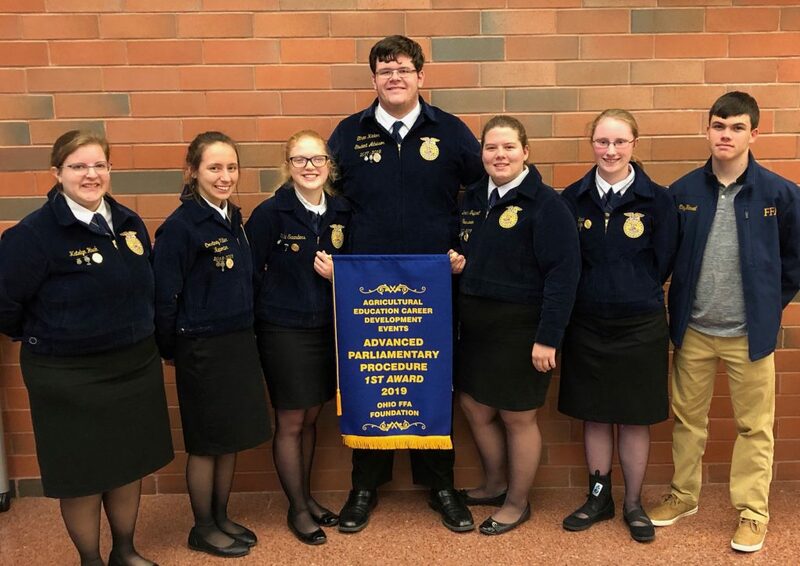 WATERFORD, Ohio — The Waterford FFA parliamentary procedure team of Ethan Hinton, Stefani Saunders, Leeann Trippet, Katelyn Huck, Anna Jones, Courtney Miller and Clay Hansell won the state contest Dec. 15 at the Columbus State-Delaware campus. Twenty teams advanced to the state contest out of approximately 200 teams from across Ohio. The Waterford team won their preliminary heat, advancing them to the state finals. This state championship in the Advanced Parliamentary Procedure contest marks the third time in the history of the organization’s charter. The team has now advanced to the National FFA Parliamentary Procedure contest that will be held at the 92nd National FFA Convention in Indianapolis in October 2019. The team will also appear on stage at the 91st Ohio FFA State Convention in May and will be recognized with a first-place banner for their accomplishment. The team is coached by Matthew Hartline, chapter adviser. UTICA, OHIO — The Utica FFA chapter hosted an Ohio FFA Association State Leadership Night Dec. 14, designed to give students the tools they need to develop leadership, personal growth and career success. Members were challenged to decide where they are in life, and encouraged to identify some expectations people in their lives have of them. The group then discussed how to exceed those expectations. Students from Licking Valley, Northridge, West Holmes and Utica attended the event. The state officers who led leadership night were Austin Becker from Fairbanks and Tyler Zimpfer from Anna. FAYETTEVILLE, Ohio —The Fayetteville FFA had 45 members compete in the SAE is for Me poster contest. The students made posters to represent their individual SAE’s (Supervised Agricultural Experience) in the areas of entrepreneurship, improvement, and placement. There were incentives of prize money for the Best of Show, $75, and then $25 for each winner in Best Placement, Entrepreneurship, and Improvement categories. JEROMESVILLE, Ohio — The Hillsdale FFA chapter sent two parliamentary procedure teams to the state competition Dec. 15 in Columbus. The advanced team members of President Blayne Bartter, Secretary Lauren Ohl, and members Shawna Barr, Clay Schoen, Josie Rowland, Sarah Yeater, Megan Schwendeman, Alex Becker, Lilly Bolen and Caleb Murawski placed third in the state finals. Novice team members include: President Brody Schoen, Vice President Brayden Bartter, Secretary Lacey Fickes, Treasurer Katelynn Smeltzer, Reporter Makayla Moody, Sentinel Ethan Goodwin, Student Advisor Madeline Kellogg, Members Vin Johnson, Mackala Krichbaum and Cassian Filbrun. The novice team placed fourth in the preliminary round. BELOIT, Ohio — Students in the West Branch FFA chapter are wrapping up the year by earning certifications and giving to others. Recently, members in the Agricultural Mechanics classes completed a unit on tractor safety and, with the loan of a tractor and spreader from Cope Farm Equipment, were able to spend a week practicing safe maneuverability skills with and without an implement. Students also recently conducted their annual fruit sale. As part of the fruit sale this year, members raised extra money by talking with local business owners in order to purchase some extra fruit. Most of the extra fruit was bagged and given to 85 families in the community as part of the school’s food drive to help people in need. The remaining fruit was donated to several shelters in Mahoning County. CHILLICOTHE, Ohio — On Dec. 10, members of the Zane Trace FFA chapter, along with Zane Trace Principal Ty Wertman, dedicated the Pioneer Pantry Blessing Box. The box was constructed by students in Ag Mechanics classes and installed next to the high school entrance. The Blessing Box will allow students in the district to access the free food, toiletries and household items provided by the Pioneer Pantry outside of school hours. The project took two months to complete. On Dec. 10, members of the Zane Trace FFA and Pioneer Pantry committee traveled to Church Triumphant Food Pantry to assist with distribution of food to area residents. The members assembled boxes of staples, helped register pantry patrons and carried the heavy boxes to vehicles. The students had the opportunity to see some of their own produce being included in the boxes as well. Seventy quarts of grape juice, 12 jars of salsa and pickles and 5 bushels of fruit from the chapter fruit sale were donated. The juice, salsa and pickles were all canned by students in the agriculture program during the fall. Additionally, 20 whole chickens and 12 pounds of sausage that students raised and produced were donated. The chapter hosted its fifth annual “Coffee and College” event Dec. 14 at Zane Trace High School. Fourteen recent graduates who are in post-secondary education programs formed a panel and fielded questions from moderator Abbey Mohan, the current ZT FFA Secretary. The panel members represented six different colleges including: Ohio State University, Ohio University, Morehead State University, Miami University, OU-Chillicothe and Southwest Missouri State University. To encourage attendance by current high school juniors and seniors at Zane Trace, FFA members prepared breakfast casseroles, donuts, coffee, hot chocolate and juice for all attendees. Sixty-five current high school students participated. During the chapter’s annual fruit sale fundraiser this fall, members were able to raise $3,500 in funds to support chapter activities throughout the year. Next articleHow closely did you read Farm and Dairy in 2018?